Welcome back to another BEST interview. Today we make a virtual travel to Saint Louis, Missouri, to meet Stephen Lott, creative head behind Books by Stephen. You can find him on Flickr, Twitter, and Facebook by searching for "booksbystephen", and he is also blogging at booksbystephen.blogspot.com. Hi Stephen, thank you for this opportunity to ask you some questions. Let's start with your books: What kind of books do you make? What materials do you use and what techniques are your favorite? 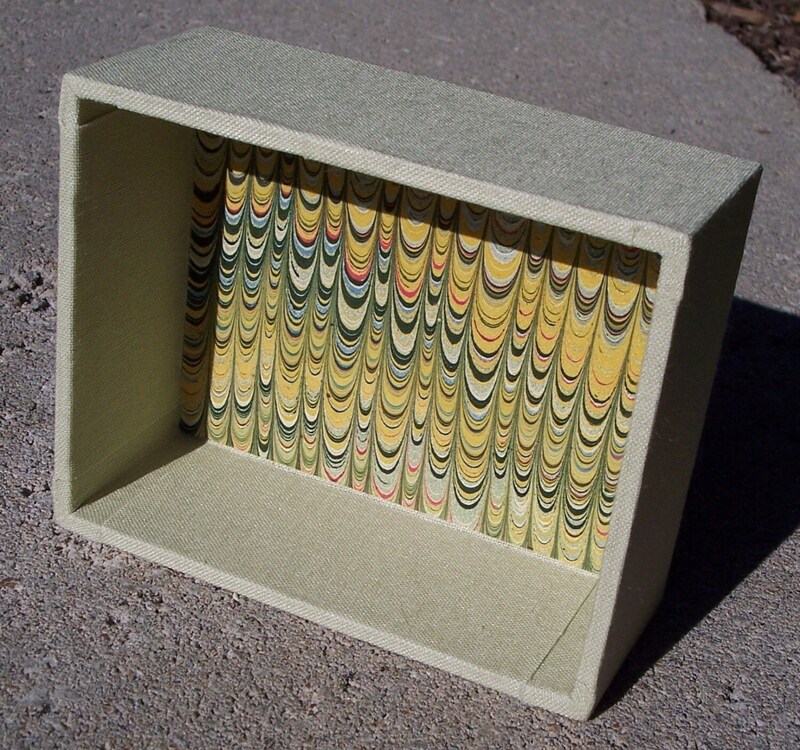 I started bookbinding by learning how to make flat back case bound books. 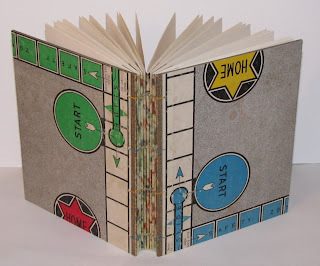 I also enjoy the challenge of making a rounded spine book now and then. Since learning how to make Coptic sewn books, I have enjoyed this process. I want to experiment with and learn new Coptic sewing. More recently, I have enjoyed painting Arches text weight paper and finding ways to use this in my books. I enjoy creating a whole book with the painted paper as the signatures once I have enough of them, and I would like to do more with the painted paper by using some printmaking techniques. In addition to books, I enjoy creating box structures from time to time. That sounds like you have a head full of ideas and inspiration. Where does it come from? I find inspiration all around me. Probably the biggest source of inspiration for me is finding a way to incorporate ephemera or other vintage materials into my books. Playing with color and texture is also a motivating factor in my work. My Mom gave me a large tin of old buttons a while back and I enjoy finding ways to incorporate those into my work. 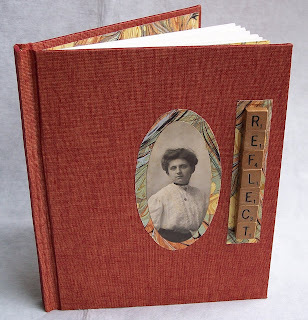 I love the idea of using something old on a project; I think about the fact that the user of the book will be giving new life to the button, old book cover, or a cut out image from a book. My mom's side of the family has quite a bit of creative energy - musical and artistic talent. I always knew that I possessed these talents too, but it took me several years to find my niche. In 2004, I visited an art exhibit in which an artist used an x-acto knife to cut out small squares from large sheets of white paper. - It looked like a cityscape. My mind went back to the x-acto knife kit that my great grandpa gave me when I was a child. I decided to pull that out once again. This, along with some watercolor paints led to the creation of stained-glass-like greeting cards made of paper. 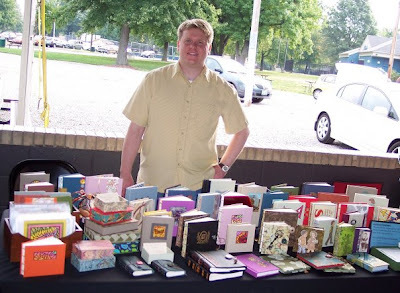 In 2006, I went to an art fair and discovered a local book artist. I loved her work! As we talked I learned that she offered classes at her studio. I took one class, then another, and was hooked. In second grade, my teacher was telling us a story about what she had seen on her way to work. My hand shot up in the air, and I asked her where she worked. Surprised, she informed me that teaching was her job, to which I replied, "You mean you get paid for this?" I didn't intend it to be an insult. Quite the contrary. She made teaching look like so much fun - all the colorful bulletin boards, the mounds of school supplies, not to mention her witty sense of humor. Until that moment, I assumed that teachers lived at school - in the teacher's lounge; I just figured that they "volunteered" in much the same way that parents do. At that moment I decided I wanted to be a teacher. Currently, I am in my thirteenth year as an elementary teacher. The last nine of those years have been as a second grade teacher at an independent school in St. Louis. My school community has been quite supportive of my bookbinding endeavor; I would not be where I am today without their support and feedback. Is there one book among the many that you created one that you think is special? Yes, it is called "Our Dreams For the World" - let me tell you its story: One of the units taught is my class in "Coming to America". One of the things we do in this study is to use old hats, scarves, and pieces of fabric to dress students up as immigrants from long ago. Near the end of the unit, students receive a passport that features this photo, and they create a fictional character. Each student also receives a handmade journal (bound with binder rings) covered in fabric. This year, they are getting fabric from their grandparents; one child obtained part of her grandmother's wedding dress for the project. In the journal, the children write a historical fiction account of being an immigrant 100 years ago. The end sheets are made using a book that we study early in the year; it focuses on diversity and culture throughout the world. A few of these books were made; one was sold at our school auction and helped to raise money for financial aid. I was honored and proud to have made this contribution. This is indeed a beautiful book. Thank you for showing it to us! Thank you for featuring me and my books in this interview. This is a wonderful interview! It's great to find out more about our Team members and their inspirations etc. The "Our Dreams for the World" book project and the class project on "Coming to America" are a great idea. It's so much more interesting to learn history in this way - and much more meaningful and memorable too. I love the photo of you with soooo many lovely books!